The O’Reilly Auto Parts 300 is the second race of the second round of the 2018 NASCAR Xfinity Series playoffs. The playoffs began with 12 eligible drivers and are divided into three rounds with the first two rounds consisting of three races apiece, followed by a final, single-race round at the Homestead-Miami Speedway season finale. Four drivers are eliminated after each of the first two rounds to ultimately establish four finalists at Homestead. Drivers automatically qualify for the next round with a win in the current round with the remaining spots determined by the point standings. At Homestead, the top-finishing driver among the four finalists wins the championship. Custer led the 2017 Xfinity Series with 422 points at 1.5-mile tracks after winning the season finale at Homestead by 15.405 seconds and winning Stages 1 and 2. Earlier this year at Texas, Custer ran inside the top-five for the majority of the race and finished fourth – his best career finish at the 1.5-mile oval. Custer has earned a top-five in all three of his Xfinity Series starts at Texas Motor Speedway. Custer’s most recent start on a 1.5-mile oval was two weekends ago at Kansas Speedway in Kansas City. Custer was involved in an accident on lap one and had mechanical issues. With no power steering, he added grip tape to his steering wheel and stayed in the race to finish 26th. The O’Reilly Auto Parts 300 is the ninth of 10 races on 1.5-mile tracks on the 33-race NASCAR Xfinity Series schedule. Custer has earned two poles, five top-five finishes, six top-10s and has led 50 laps in the eight races run this season on 1.5-mile tracks. Custer’s average starting position of 6.3 and five pole awards leads all Xfinity Series regulars this season. He has earned 19 top-five starts and 24 top-10 starts in the 2018 Xfinity Series season. Custer is seventh in the 2018 Xfinity Series playoffs with 3,011 points, 23 behind the cutoff position that will advance to the championship round. No Monster Energy NASCAR Cup Series drivers are entered in the O’Reilly Auto Parts 300. Stewart-Haas Racing (SHR), the championship-winning NASCAR team, has partnered with Autodesk, a leader in software applications for the architecture, engineering, construction, manufacturing, media and entertainment industries. Autodesk will be the primary sponsor of the No. 00 Ford Mustangthis weekend at Texas. 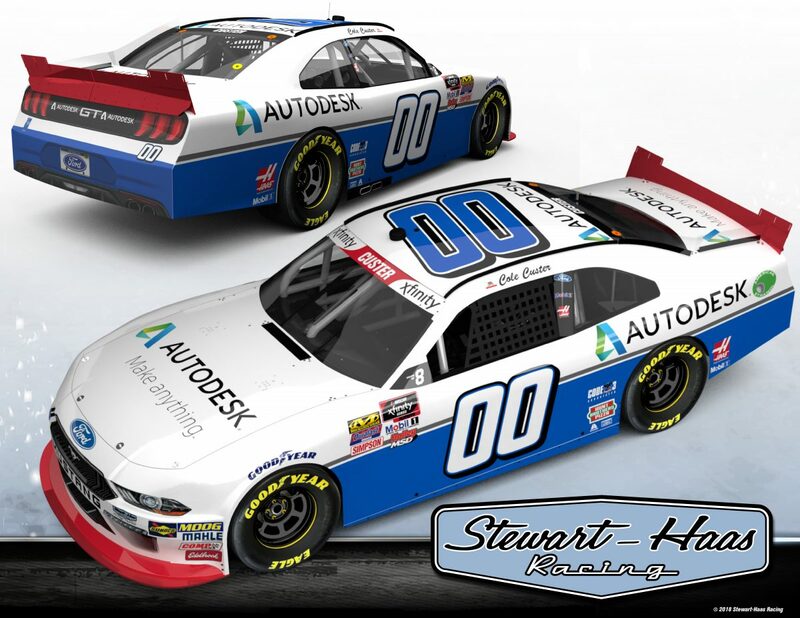 While this will be Autodesk’s first appearance on a racecar fielded by SHR, the software company has played a significant role in SHR’s success this season, which includes 14 victories across the Xfinity Series and Monster Energy NASCAR Cup Series. Autodesk’s advanced Power Inspect software is used to analyze precise points on SHR’s fleet of racecars. This ensures compliance with NASCAR’s technical regulations while simultaneously aiding designers in increasing competitiveness based on simulation and track testing. Utilizing Autodesk’s PowerShape and PowerMill software, SHR is able to produce complex geometry components that are proprietary to SHR and meet the demands of a high-performance environment. Headquartered in San Rafael, California, Autodesk makes software for people who make things, whether that’s a racecar or a skyscraper. How important is it to have a partner like Autodesk involved behind the scenes of our race team? Texas is statistically your most consistent track in the Xfinity Series. What is it going to take to put yourself in a position to advance? Its seems like stage points can make or break your championship opportunities. At Kansas, you ran the entire race with grip tape on your steering wheel after your power steering went out. How was that? What is it about Texas that make you confident about making up the points deficit?